I like to think of this as a summer salad in a soup. A beautifully refreshing, fragrantly deliciously ice-cold soup, perfect on a hot, sticky day. It’s an excellent way to use up those salad ingredients that have been sat in the fridge just a little too long. I always seem to be over ambitious when I buy salad stuff. Ideally you should buy your salad the day you’re going to eat it – ideally from a fabulous farmer’s market where all the produce has been grown within a few miles’ radius. But like most people, I do a weekly shop at the supermarket and by the end of the week, the contents of the salad drawer are beginning to look a little sad. This soup is definitely the solution. What’s more, it’s a cinch to make too. I can’t be bothered to peel and seed my tomatoes, or peel and salt the cucumber, as gazpacho recipes usually demand. Clearly if I were entertaining and out to impress, I might push the boat out and make a little more effort. But when I’m rustling up a speedy lunch, I simply bung everything in a food processor, give it all a quick whizz and in seconds you have the most glorious gazpacho. Job done! This really couldn’t be easier. Simply place the cucumber, tomatoes, spring onions, herbs and garlic in a food processor and blend. 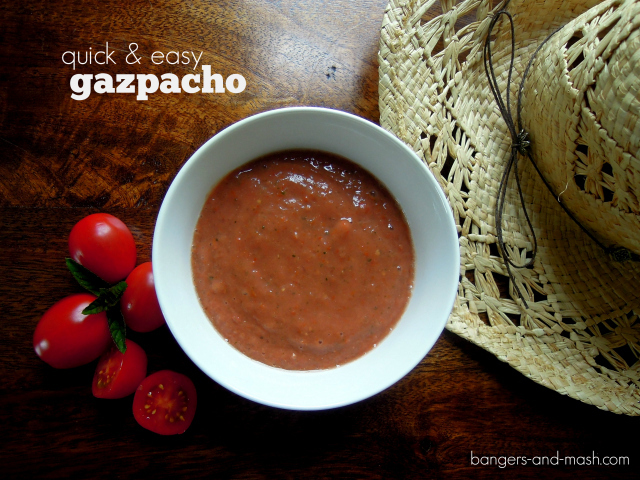 I like my gazpacho to be quite smooth, while my husband prefers it a little chunky. So we usually end up somewhere in between. Stir in the olive oil and lemon juice, and season with celery salt and pepper to taste. Chill in the fridge for a couple of hours. Serve with a drizzle of olive oil and, if you like it really cold, a couple of ice cubes. 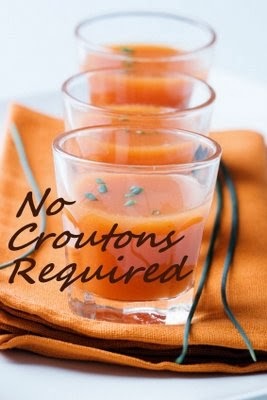 No Croutons Required is a monthly blog event for soups and salads suitable for vegetarians, hosted by Lisa’s Kitchen and Tinned Tomatoes. I think this soup fits the bill. 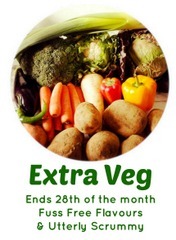 Vegetable Palette is a new vegetarian blog challenge from Allotment 2 Kitchen, which calls for dishes made from fruits or vegetables of a chosen colour. July’s theme is red, so I think this tomato-based soup is perfect. 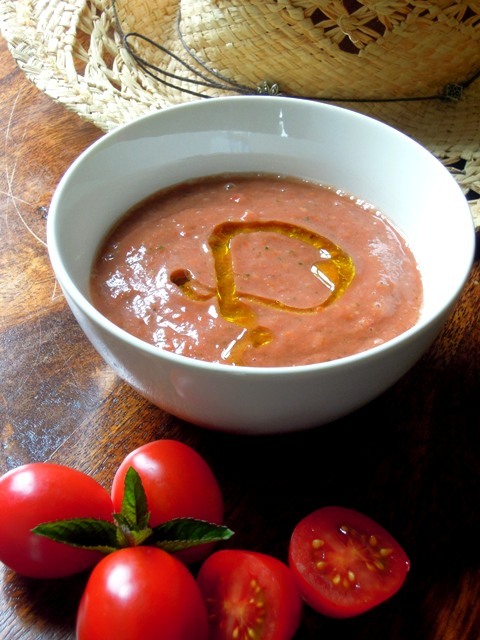 With all that tomato and cucumber, I think this gazpacho definitely qualifies as a serving of Extra Veg, which is the theme for the blog challenge hosted each month by Fuss Free Flavours and Utterly Scrummy, and this month is being guest-hosted by Juggle Mum. 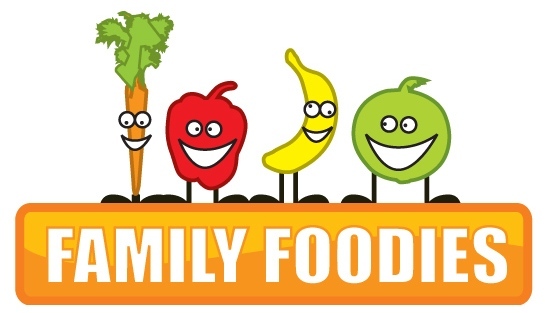 Of course, I’ve got to enter my soup into July’s hosted Family Foodies, the blog challenge I take turns in hosting with Louisa at Eat Your Veg. This month the theme is Chill Out, Baby! Al Fresco is the theme for this month’s Four Seasons Food, a seasonal blog event hosted by Eat Your Veg and Delicieux. 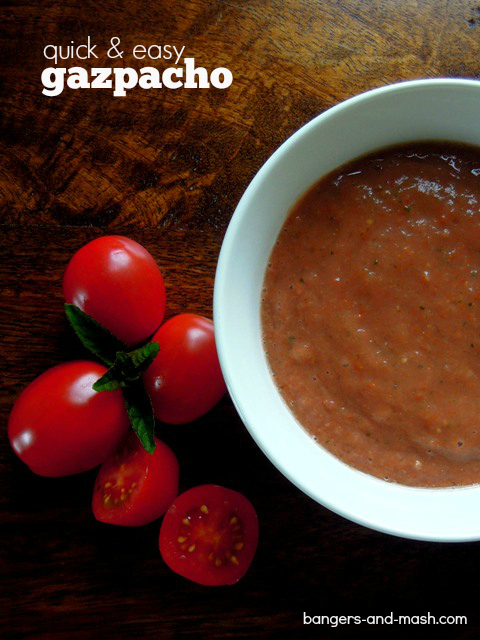 I reckon this gazpacho would make a lovely lunch to eat out on the patio. 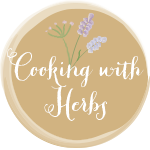 Basil is the theme for July’s Cooking with Herbs challenge hosted by Lavender & Lovage, and as my soup features lots of lovely basil (and mint too), I’ve just got to enter it. 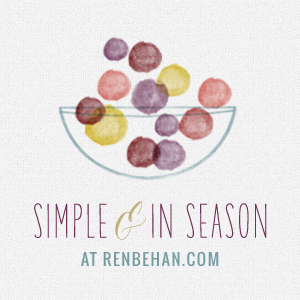 And finally, with all those seasonal salad goodies, I’ve got to enter it into Ren Behan‘s Simple and in Season challenge, hosted this month by My Custard Pie. Sounds incredibly refreshing, perfect for the intense summer heat we’re experiencing at the moment. Thanks Julie. Yes it is absolutely perfect for this hot, muggy weather right now. Fantastic, thank you soooooo much for sharing. I always shy away from cold soups, but have to try it out some day. I love that you used the skin and seeds in the soup too , pretty thrifty and less time for all that palaver of peeling and de-seeding. Wonderful summer soup. Thanks for sharing with NCR. The roundup will be posted soon. Thanks Lisa – looking forward to the round-up.